I myself am wearing the costume! I wanted to be a peacock, but could not find a cute costume to buy so I made this my self! the tu-tu is just tool tied to elastic. I bought a strapless shirt and glued feathers to the top. The tail feathers are peacock feathers I had in a vase for decoration in my house! Love the costume and this is my plan for this year! Question though... How did you make the tutu so puffy?! All the instructions on how to make your own make it seem quite thin. Did you use more than one piece of tulle per tie?? 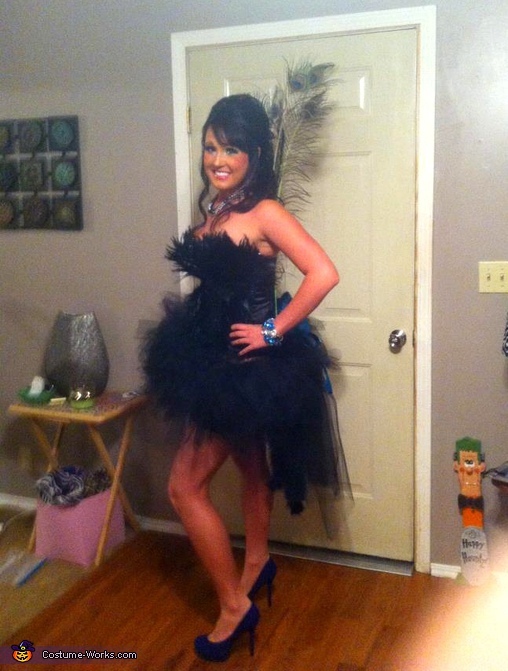 I absolutly luv your costume, i am doing one similar this year only I purchased a corset dress and am going to add to it. I see that you have black feathers in the front. What kind of feathers are they?